Are your walls empty and blank, longing for love and attention? Would you like greater peace for your environment? Timeless, beautiful art that inspires you? That’s where Luminous Visions come in. Late one evening I sat down to relax, enjoy and create. I started playing with my library of photographs. I started layering them and layering and layering. I felt as if I were painting with a new medium. While layering the photographs, including photographs of paintings I had done, I was drawn into the experience of playing with color and composition, with shadows and light, contrast and compliments, texture and design. Visions appeared. Portals emerged. Dream-like landscapes reflected the changing light of day or night, almost moving with their surroundings. The images, in their layering, took on a life of their own and a new art form was born. One that has been called magical, healing, and peaceful. People have asked whether they are watercolors or paint. While I have studied classical painting since I was a child, they are neither. I call them Luminous Visions. Elizabeth Welles loves the art of storytelling in any form, be it with paint, on the page or the stage. 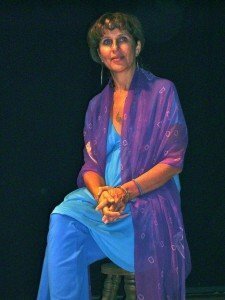 She is the creator of Luminous Visions Art, the author of books and CD’s, and she tells stories in a variety of venues, from NY to LA, on stage, in television, film, and on the radio. She is an authority in the field of journaling, author of the book, Journaling for Well-Being & Peace, editor of the book, Women Celebrate: The Gift in Every Moment, and creator of the CD, Meditation for Relaxation. She founded The Four Wisdoms of Creativity, wisdom principles that enhance personal creativity while reducing stress. As an actress, Elizabeth regularly performs her one-woman shows, Speak the Lands of My Heart, about a journey to India, and Water from the Welles, an entertaining collection of monologues, stories, poems and songs that connect the listener to their own resources of wisdom and compassion. She is an artist with the tools of healing, dedicated to nurturing the seeds of creativity, joy, and peace that reside in the human heart. A creativity jump-starter, she inspires people the world over to explore their own unique creative genius. To follow the current of their own intuitive vision and voice that adds joy, light and spice to life. Elizabeth offers mentorship and coaching.